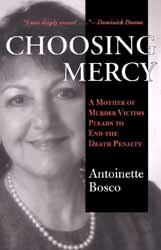 I wrote Choosing Mercy from the depths of pain I had endured when I received the news that my son John and his wife Nancy had been murdered in the middle of the night on August 12, 1993 as they slept in their newly purchased home in Montana. Confronting such evil, I had to search deep inside my soul to learn who I would become once the world tipped upside down began to right itself again. Choosing Mercy tells the story of this journey, the lessons I've learned, that can be shared and passed on.